College can be the best time of your life; it can also be filled with tons of minor headaches. Between managing classes and keeping the budget intact, it’s important to save a little here and a little there. As a result, we cling to our tools and protect them like parts of ourselves. The thought of losing them is akin to some kind of natural disaster. Laptops are among the devices we use that rank most highly on the list of things to protect because they accomplish and save our works. Plus, they’re a great source of endless entertainment. To stay frugal, most college students use their laptops on campus WiFi of some sort. Purchasing a data plan for your laptop costs an inordinate amount of money, and there are so many public access points that it hardly seems worth the cost. What few realize is just how costly campus WiFi can become. 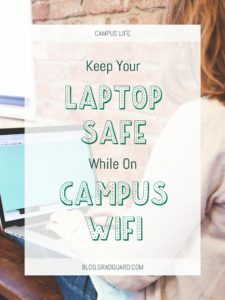 Campus WiFi is free—not counting the huge tuition costs associated with just being present—and many colleges have made a point to ensure adequate speed is provided for all attending classes. What they haven’t provided is a secured connection. But what exactly is a secured connection? When you access WiFi, you’re either connecting to a password-protected, encrypted network, or you’re connecting to an unsecure network. Without the use of basic security measures, everyone connected is vulnerable to outside attack. Hackers are especially fond of public WiFi systems because they can scan through multiple victims to find data worth stealing, such as names, addresses, credit card information, social security numbers, etc. It isn’t even a big challenge either; an amateur hacker is able to hack an open WiFi network in just under 11 minutes. Knowing that, what can you really do? All is not lost. There are several security measures you can take to make sure your use of campus WiFi is considerably safer. So the campus hasn’t done its job; now what? Your best bet is to take steps to encrypt your own internet connection. Doing so will keep hackers out of your laptop and let you focus on doing what you came to do at college. The best way to do that is by subscribing to one of the many Virtual Private Network (VPN) services available. Once a tool used predominantly by businesses and major universities for faculty, a VPN allows you to connect to a remote server before the rest of the net. These remote servers then encrypt your connection and allow you to do whatever it is you need to get done safely. You might be asking yourself, “What exactly is encryption?” Simply put, encryption scrambles data into an unreadable format that can only be read with the right code. Because the code is so complicated on industry-standard encryption (typically described as 256-bit AES), hackers and other criminals can make no use of stolen data that’s been encrypted. With that kind of system in place, you have little to be concerned about in terms of being hacked on WiFi. That’s not to say there aren’t other risks though. 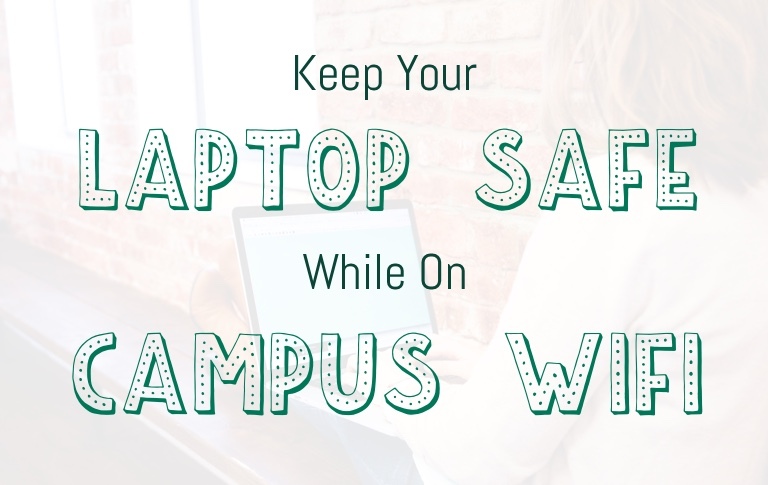 Utilizing campus WiFi has many perks, but it also means taking your precious laptop to a very busy location. Even small colleges will typically have hundreds of people buzzing around at any given time, and the incidence of theft is relatively high at these locations. As a result, it’s very important you take measures to make sure your laptop isn’t just stolen outright. Keeping an eye on it is a good first step; if you don’t leave it unattended, you’re considerably less likely to experience theft. But data on your laptop is valuable, so valuable that you can’t leave things to chance. Make sure your laptop is properly locked up tight with a login password of considerable difficulty. Any personal information should be avoided in terms of the actual password content, as should full dictionary words or themes related to the university. Stick with passwords that contain a minimum of eight characters, have a mixture of upper and lowercase letters, contain numbers, and have symbols. 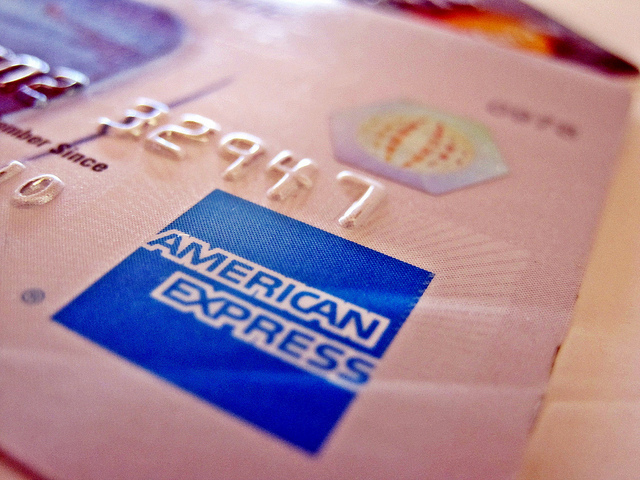 Long passphrases are also a good alternative, as they’re easy for you to remember but not so easy for thieves to guess. Another step to consider is installing an anti-theft app. Several services exist, including PreyProject and Norton Anti-Theft, that allow you to track your stolen laptop and shut down functions from afar to prevent anything from being taken off the device. In the event your laptop winds up lost, it can also be worth leaving your contact information on a sticker affixed to the exterior so Good Samaritans can help you recover your goods. There’s no question that what your laptop has on it is valuable to someone else. We live in a world where information can sometimes be more valuable than natural resources, and hacking has practically become its own black industry. That isn’t something we need to be afraid of; it’s just another consideration to make as we move forward in each day. By taking the right steps to protect your laptop, you save yourself time, money and much-needed focus. As the steps involved aren’t particularly complicated or expensive, do yourself a favor: secure that connection! About the Author: Cassie is a lifelong learner with a focus on internet securities and cybercrime. She spends her days blogging about online safety and what can be done to prevent data theft, identity theft and general sabotage.